As the temperatures begin to rise this time each year, apparently so do the gas prices. In the past few weeks we’ve seen a notable uptick, with more increases rumored to be on the way. In the interest of keeping cool in the midst of these higher prices, let’s take a road trip to the distant past … when gas was considerably cheaper and service station attendants actually pumped the gas for you! 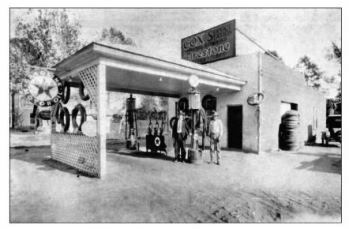 We’ll start with a look at one of the oldest Lee County service stations on record, operated by the Cox family on Trade Street in the heart of the Jonesboro section in 1929. 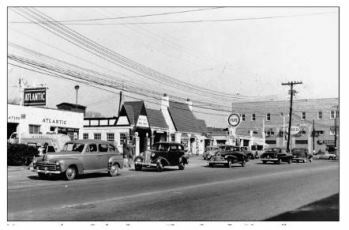 This is no longer the case, but for much of the 1940s & 1950s, Carthage Street was considered “gas station row” by local residents, with a handful of stations located pretty much right next to each other. Here’s a picture that provides us with a view of 3 different ones side-by-side-by-side. 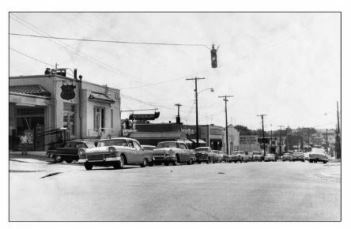 Next is a view of yet another Carthage station a little further down the street at the intersection with Steele. 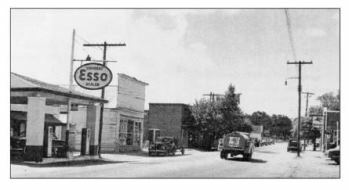 There’s no gasoline station there presently, but this Esso station, seen here in the 1940s, generated a lot of business in its heyday, largely due to its location at one of Sanford’s busiest intersections. The road we know today as Horner Boulevard (formerly Endor Street) has also always had a number of service stations. 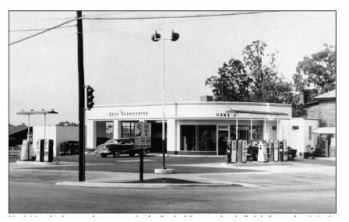 Here we see a Phillips 66 station from the 1950s. 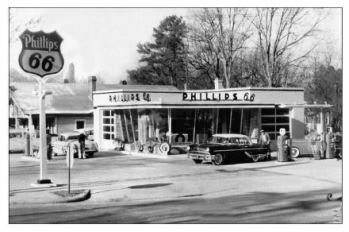 In that same time frame, there was also a Phillips 66 gas station located at 502 Carthage Street (where the Cutting Edge Hair Salon, among other businesses is based today). This also seems like a good time to note that these were truly “service” stations in those days. Gas station attendants actually came up to the driver’s window to find out how much gas the customer wanted, pumped the gas, cleaned the windshields and completed the transaction. “Self service” stations didn’t become popular until the 1970s. As our final pit stop, let’s also make note that baseball season is underway, and visit a long-departed service station at the corner of Endor (Horner) and Carthage in 1954. The gas station won’t look familiar, but it’s owner should. Hank Nesselrode was a popular player for the Sanford Spinners minor league team and his likeness appears on a mural in downtown Sanford. He settled in Sanford and got into the gas station business after his career was over. 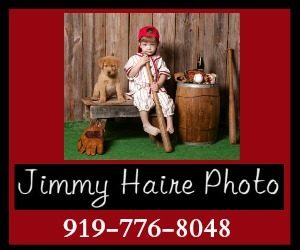 Editorial content, pictures and research background, compliments of Jimmy Haire and Images of America: Sanford and Lee County, by Jimmy Haire & W.W. Seymour, Jr, available here for purchase. All book proceeds go to Sanford’s Railroad House Historical Association, Inc.